Using swim hand paddles will strengthen your swim stroke and improve distance and propulsion. Becoming a competitive swimmer means conditioning your body to swim in the most efficient manner possible. This means you will have to do far more than swim in the pool on a daily basis and perfect your technique. You will also need to use special swim gear to provide you with the training you need to become a stronger swimmer. One of these important tools is swim hand paddles. When you choose the best paddles, you will be able to enjoy all the benefits as you improve your swimming times. The Strokemaker paddles are the oldest and still the best swim hand paddles you can use to help strengthen your arms so you can strengthen your stroke and swim faster. With the holes in the design, your hands will still get the feel for the water as you swim, while providing you with the resistance you need to strengthen the muscles that are responsible for distance and propulsion. The colors of the paddles will also help the coach to see the swimmer’s hands to provide additional tips for improving technique. Created by the inventor of the Strokemaker, these translucent color-coded paddles will provide the strengthening qualities you need from your swim hand paddles, while causing less strain on your shoulders. When you use hand paddles, your goal is to strengthen your muscles, not strain them. 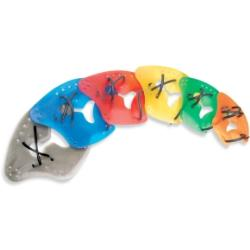 The multi-hole strap design allows you to best center your hand for the best results. The TYR Catalyst is available in several sizes for beginners up to the professional swimmer. The Speedo I.M. Tech Paddles allow swimmers to use the paddles to train with all four main strokes, including the breast stroke. You will be able to interchange the paddles between your right and left hands for a different feel. With the tube straps, you will experience the greatest comfort while using these paddles to train and increase your strength. The I.M. Tech Paddles provide pronounced edges that will give you a good feel for the catch of your stroke so you can improve. The final of the best swim hand paddles is the Speedo Power Paddle. This paddle is intended to strengthen the muscles for those who swim for fitness purposes, rather than competition. The broad blades are intended to give you the most resistance for a better workout. However, the water will still be able to channel through with the holes, which can also increase the pull of the water so you can strengthen your arm muscles.